HSSC Gram Sachiv Syllabus 2019 Pdf (एचएसएससी ग्राम सचिव सिलेबस हिंदी पीडीएफ – हरयाणा ग्राम सचिव पिछले वर्ष के कागजात) Haryana Staff Selection Commission is going to conduct the Gram Sachiv recruitment exam for candidates who want to get Government Jobs in Haryana State. For the selection on Haryana Gram Sachiv Jobs, candidates must be qualified in the written exam with good marks. 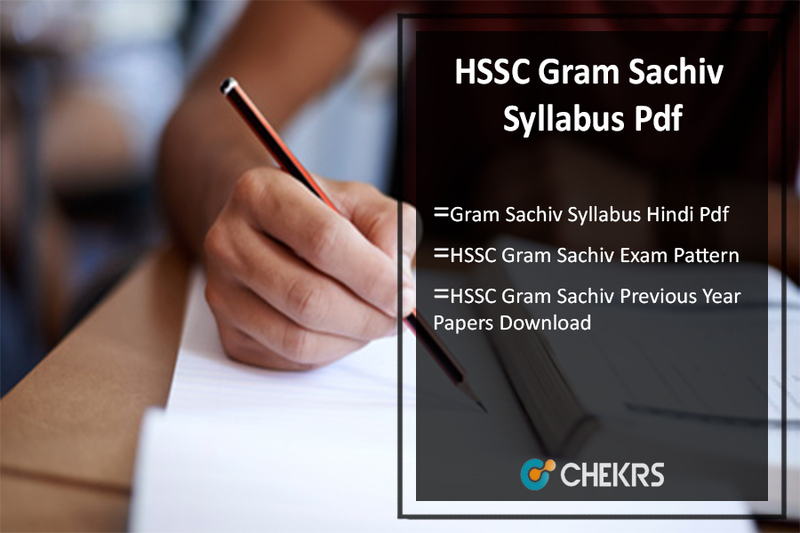 The HSSC Gram Sachiv Exam Syllabus Pdf will help the candidates in their exam preparation. Eligible & interested candidates preparing hard to qualify the exam can go through HSSC Gram Sachiv Sample Papers and prepare well for the exam. The HSSC planning to conduct the HSSC Gram Sachiv Exam 2019 in upcoming months. All the applicants need to prepare well to get selected for the further selection process. The details of Haryana Gram Sachiv Syllabus, HSSC Gram Sachiv Exam Pattern, previous question papers, cutoff marks, the release date of hall ticket & others in the article below. Applicants preparing for Gram Sachiv Examination must refer to the Haryana SSC Gram Sachiv Syllabus Hindi Pdf and start preparing well for the examination. By referring the syllabus the contenders can have a clear idea about each topic. The syllabus includes various topics which the candidates need to practice during the preparation of the exam. With the help of Haryana SSC Gram Sachiv Exam Pattern, it will become easy for the applicants to analyze the topics which are important and which are not. Therefore the candidates with the help of Haryana Panchayat Secretary Exam Paper can crack the examination easily. Go through the Syllabus mentioned below and get complete details. It is very important to know Haryana Panchayat Secretary Exam Pattern so that the candidate can have a proper idea of marks distribution along with duration and get a proper idea about the scheme of written examination which is provided by the Haryana Staff Selection Commission. General Awareness Current Events – Haryana, National, International, History of India & Haryana, Geography of India & Haryana, General Politics, Indian Constitution, Science & Technology, Culture & Heritage of India & Haryana, Social Events related to Haryana & India etc. Arithmetic Ability Percentages, Mixture and Allegation, Profit & Loss, Discount, Square roots, Ratio and Proportion, Interest, Averages, Trigonometric ratio, Circle and its chords, Time & work, Quadrilaterals, Time and distance, Regular Polygons, Graphs of Linear Equations, Standard Identities etc. Reasoning Ability Arithmetic Number Series, Spatial Orientation, Alphabet Series, Non-verbal series, Figures Classification, Relationship concepts, Analogies, Arithmetical Reasoning, Similarities and Differences, Discrimination, Spatial Visualization, Observation, Visual Memory, Coding and Decoding etc. General English Vocabulary, Comprehension, Fill in the blanks, Error Detection, One Word Substitution, Transformation of Sentences, Precis Test, Tenses etc. Haryana SSC Canal Patwari Sample Papers are available now. Applicants preparing for Gram Sachiv Examination can now get proper idea about the exam by going through HSSC Panchayat Secretary Previous Papers. Candidates can now prepare well for the written examination just by downloading the model papers and practicing the questions on daily basis. This will help the candidates to do proper time management and score well in the exam. Applicants can get the HSSC Gram Sachiv Model Papers pdf enclosed below. To get the latest update on HSSC Gram Sachiv Exam Syllabus 2019 along with the exam pattern, keep visiting our site www.jobs.chekrs.com. For any query or review, we welcome your valuable comments in the commenting section below and our team will revert you in short while.